This ubiquitous driving rule, fasten your seatbelt, is meant to protect the driver from further physical injury, not stop accidents. Because accidents happen. "My older brother had a serious car accident six years ago somewhere in Manila. His car was unbelievably wrecked at the hood, its windshield smashed to bits. He survived the ordeal with some serious cuts in the arms, a broken rib, and a broken glass buried deep onto the crown of his head. It was a good thing that his head did not slam heavily to the windshield —it would've been his demise." He was wearing a seat-belt on. That protected him from further injury in the head. 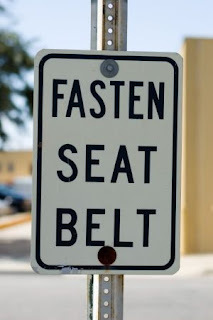 If you've been driving for a while, you should know better —wearing a seat-belt is a good habit. The same thing is true in life, in goal-setting, in dreams: if you've been focusing a great deal on details, the destination, the future comfort, but, never thinking it necessary to buckle up for the "unexpected" —you'll fall hard. On a rocky road. Or from uphill. Where do you anchor your hopes? Your security? Your strength? Will these hold long enough to save your life from the unexpected? Do they really matter as much as you think they do? Will you survive? It's time. . . buckle up.